Who doesn’t appreciate a little shopping help at this time of year? I’m here to help you with find something fabulous for someone on your list from my very generous and fantastic sponsors. Plus, you get a chance to celebrate your Cubanity. I don’t see a downside here. 1- Habana Brand Clothing has the greatest choice of Cuban tshirt designs and of course, my favorite, the Cuba hats. If you were paying close attention, you would have seen these in every video of the beautiful people dancing and celebrating on Calle Ocho after the Death of the Tyrant. This is definitely The Year of the Cuba Hat. Starting at $18.00. It’s definitely a steal. Find them at Habana Brand Clothing. Here are my kids Embracing Their Cubanity in those fabulous Habana Brand Hats. Enjoy. 2- I have to point you in the direction of Santayana Jewelers in Miami for the lady in your life who appreciates the finer things. Or just the funner things. My favorite (and soon to be her favorite, too) is the leather bracelet with all the Cuban charms. There’s just nothing that screams Cubanity more than this beauty. Come on! Who doesn’t love a pastelito and a cortadito? You would so own NocheBuena with this amazing gift. Santayana Jewelers does it again. I love how they embrace everything that’s fun and wonderful about our Cuban culture. Right now they’ve got a special running – $40 off your $200* purchase with promo code: CHRISTMAS2016 PLUS Free shipping on ALL $100 orders! 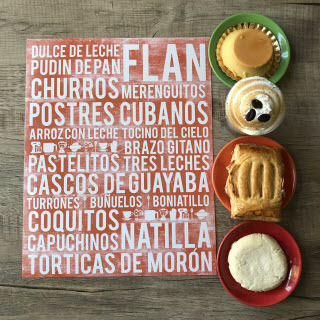 3- The next choice would be for the friend who lives in “el exilio del exilio.” In other words, in a place where there’s not a Publix on every corner, or pastelitos sold on every block. (That would be me.) 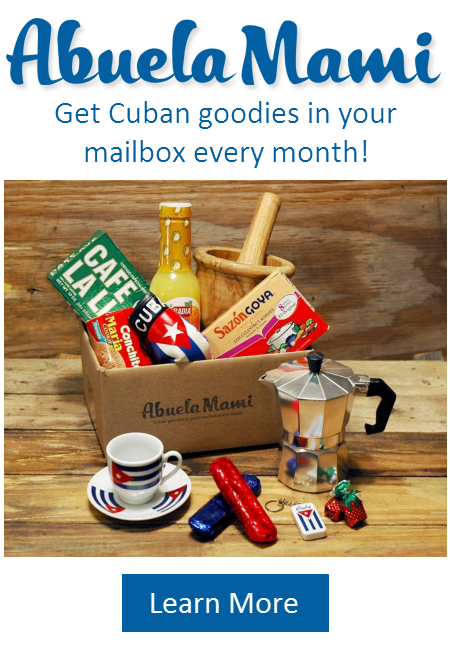 The Abuela Mami Monthly Subscription Box is what you need. Thing 1) The goodies arrive in your mailbox … Every. Month. Thing 2) It’s always some Cuban things that you took for granted growing up Cuban. Now it’s a bigger deal to get those goodies on your doorstep each month – a different box every month. Also, they would feel your love all year long. Win-win. Sometimes coffee, sometimes food, always something different and always something Cuban that is guaranteed to make you smile. Abuela Mami is bound to make your homesick friend/college student so happy. Every. Single. Month. We’re having some fun now! 4- My friend, Bren Herrera just published a beautiful pressure cooking cookbook. Fricase de pollo in just 20 minutes? She’s got you covered. And perfect flan, every single time? This is what you have been wanting in your life. Modern Pressure Cooking is the cookbook your abuela would have sighed over. I just received an advance copy and I’m already in love. Thank you, Bren! Make me proud and amaze your friends. Available at Barnes & Noble, Amazon, and Target. 5- I’m going to tell you right now how you can win the Grandparent Game. 1 – You can pick up $25 ScholarShare gift cards and drop them in their stockings. Available at both “Toys R Us” and “Babies R Us,” or directly from ScholarShare. This is the perfect week for this and an ideal gift that they don’t know they’re going to appreciate so much later. Also, ScholarShare is having a wonderful promotion this week. 2- On Friday, December 9th, 2016, open a ScholarShare 529 College Savings Plan account with $50 dollars (and sign up for on going automatic contributions of $25 or more per month) anytime from 12:01 am to 11:59 pm (PST) to participate and they will match your $50. For official terms and conditions, click here. I’ll be reminding you about this wonderful promotion again later this week and I’ll share why I think this might be the winningest gift of all. 6- For the adventurous cook in your life, you will want to check out my friend, Chef Juan Montalvo’s very cool The Hungry Cuban Paella Pan. Get your personal 15″ carbon steel paella pan and create mouth watering recipes from the comfort of your home. It is the best size for the home cook and will make up to 8 servings for all those hungry friends of yours. 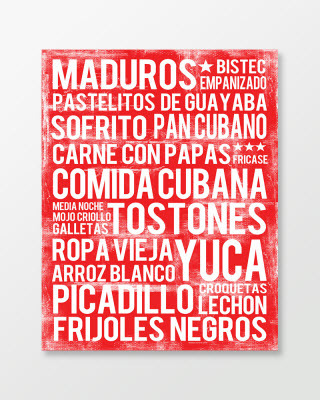 7- Of course, you could also choose one of my fabulous food posters from my shop: Marta Darby Designs. They come in 3 sizes: 11×14, 16×20, and 20×30. Also, I have them in 7 colors to match your kitchen or your living room wall. 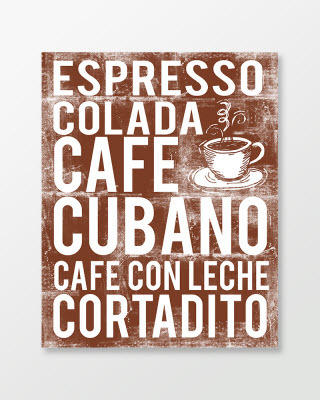 Also, I not only have Cuban Food Posters, but I’ve received so many requests from other nationalities for their own design. It’s getting kind of fun. Take a look. You have to click over to my shop to get the full effect. I have these and many more. Every day I’m adding something new. Here’s me talking about cooking and cooking and talking. Please consider shopping online from these fabulous vendors. A portion of this post was written on behalf of ScholarShare for which I received compensation. All opinions are 100% my own. Hi Marta- Super excited to see these great gifts! Especially your book. Unfortunately, Blurb is not letting me purchase your book at the sale price unless I publish a book? Would love to get this great deal before Dec.8th deadline. Please let me know if I can purchase from you directly. Gracias Marta! Hi Marta, I am having the same problem as Lisa. Sent you a message via messenger yesterday or the day before. 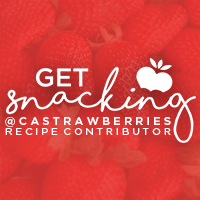 Let us know, we are excited to get cooking! 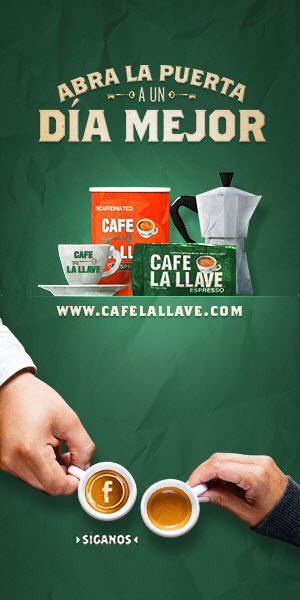 Can you make a Venezuelan poster? Surprised you don’t have one with so many Venezuelans here and in Miami! Hi! Do you have an Argentina poster? I LOVE that you mentioned Santayana!! #truecuban #truemiamian #canyoubelievefideldied ?! I love reading your blog and at Christmas I stumbled upon your Christmas list and I ordered a Cuba hat for Christmas from Habana brand clothing and loved it. I just started getting Abuela Mami sent to my house every month and got my first shipment and it was lovely. I just ordered your cookbook and was very disappointed. The price I paid and the book I received were not at all worth the money I paid. 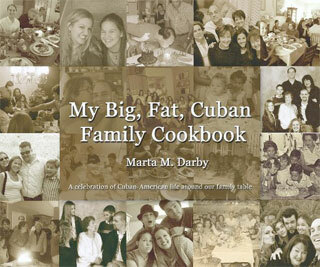 (I ordered the paperback) It also does not have any recipes that aren’t on your site. I am so sad this happened. I feel like I was completely ripped off. You do not have to post this, I did not know of any other way to let you know that a supporter of yours was so disappointed in the quality and quantity of the book for that price. I also am not looking for a refund or anything, just wanted to give input.